One of the sticking points which blocked the development of these devices was to find a measuring element providing a deformation or elongation function of relative humidity. Since antiquity, it had been noticed that the wool weight increases depending on the humidity. In 1450, the German Bishop Nicolas of Cusa, experimenting on this variation concluded that the atmospheric humidity could be measured. Over the following centuries many materials and methods were used with more or less efficiency: cat intestine extension, (ca 1600, Santorio Santorio), paper strips extension (Folli Francisco, 1660) hygroscopic salts, bending of a beard of wild oat (1665 Hookes), human hair extension (Horace Benedict de Saussure, 1783). 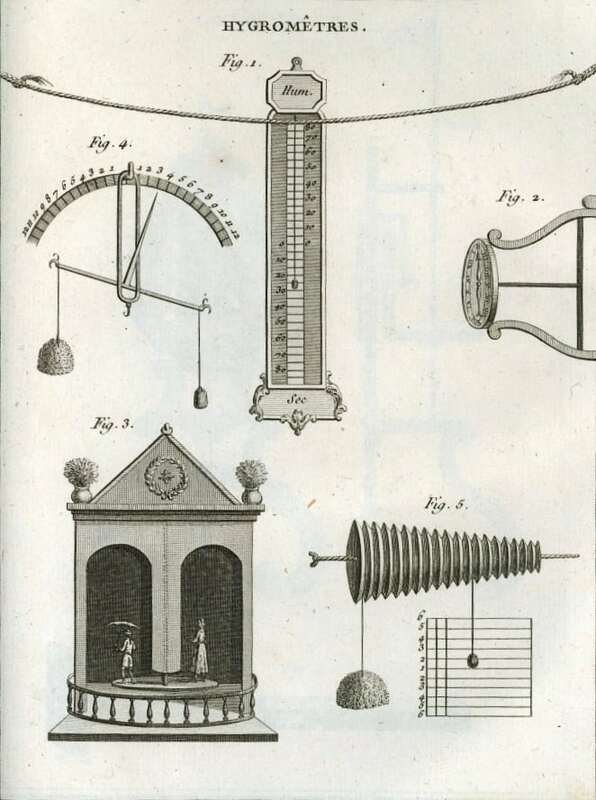 The instrument invented by the latter laid the foundation for a comparative and reproducible measure of relative humidity. The non-linear connection between the elongation of the hair and the humidity in the air were scientifically established in 1815 by the French scientist Joseph Louis Gay-Lussac. In 1882, Richard company in Paris develops a humidity recorder that uses the bending of an ox horn strip. The first device controlling humidity in air conditioning was invented in 1900 by Warren Johnson in the U.S. He used the bending of a maple leaf, and coined the word “Humidostat”. He fitted one of the first installations of air conditioning made by Willis Carrier in the USA in 1903. Since that time Humidistats and Humidostats are used in English for these controls, and Hygrostat is used in French. in the 20th century. One of their main disadvantages was a gradual change in their deformation characteristics because of measuring element aging. The technological breakout that led to the development of modern humidistats is the invention of nylon in 1938. Nylon is the plastic material of which the rate of elongation according to the relative humidity is the most important and this was quickly identified as being useful for the humidity measurement. In 1952, the first efficient electromechanical humidistat using hair as a measurement was invented by Honeywell, USA. In 1965, the same company replaced hairs with a nylon ribbon. Humidistats made by JPC use specially processed nylon ribbons, with a few microns thickness.